Heat oven to 350°F (325°F for dark or nonstick pan). Grease and lightly flour 12-cup fluted tube cake pan, or spray with baking spray with flour. In large bowl, beat cake mix, 1 tablespoon orange peel, water, 1/2 cup orange juice, oil and eggs with electric mixer on low speed 30 seconds, then on medium speed 2 minutes, scraping bowl occasionally. Stir in poppy seed. Pour into pan. Bake as directed on box for 12-cup fluted tube pan. Cool 15 minutes; remove from pan to cooling rack or heatproof serving plate. Cool completely, about 2 hours. In small bowl, mix powdered sugar, 1/4 teaspoon orange peel and 1 tablespoon orange juice. Stir in additional orange juice, 1 teaspoon at a time, until glaze is smooth and consistency of thick syrup. 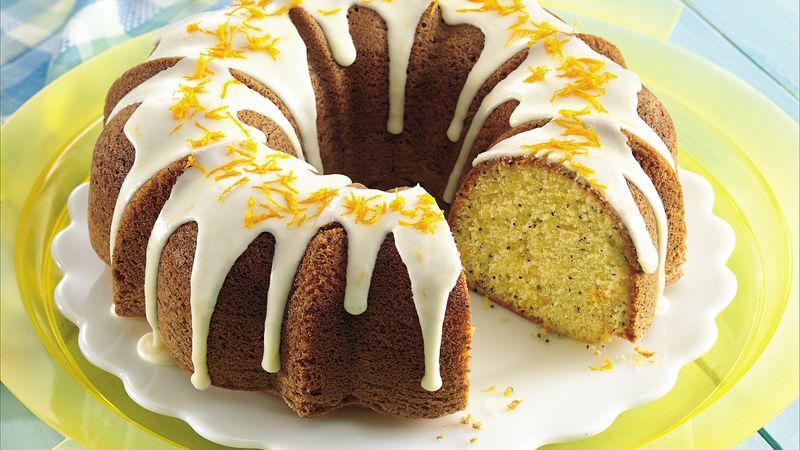 Spread glaze over top of cake, allowing some to drizzle down sides. Garnish with additional orange peel. Store loosely covered. The orange part of the peel packs the most flavor. So grate only the bright orange skin and avoid the bitter-tasting white layer. In a rush? In small microwavable bowl, microwave 1/2 container Betty Crocker® Rich & Creamy vanilla frosting with 1/4 teaspoon grated orange peel uncovered on High 15 to 25 seconds. Stir, then pour over cake.